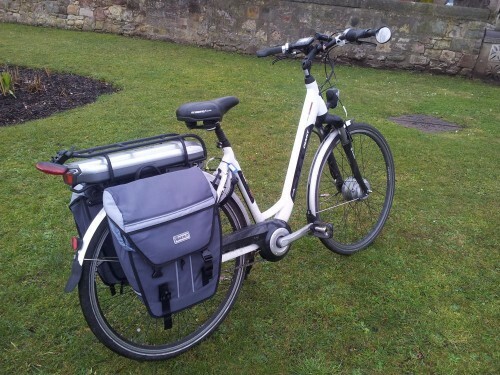 I mentioned recently on the CityCyclingEdinburgh forum that I’d welcome anyone who’d like to share their bike and experiences and wouldn’t mind being ‘featured’ in a post here. I never liked cycling. I didn’t get a bike when I was a kid (multiple reasons) and only barely managed to learn to ride a 2 wheeler by age 10. Since I was so much less competent than any of my friends, even riding a borrowed bike was no fun – they all left me behind. Grew up (well, got older, anyroads). Somewhen in the mid 1980’s there was a bus strike in Edinburgh. At the time I was living in Morningside and working in Leith. Borrowed a bike to get to work. Man’s road bike with drop handlebars – never been on one before. Fell off somewhere along Melville Drive in the rush hour, bringing all traffic to a halt. Decided I REALLY didn’t like cycling. Grew older still. Got married. Husband decided to take up cycling to work as we were hard up (new baby, he had new job in Roslin, living on Causewayside). He became a proper cycling enthusiast. I was still totally uninterested. Grew even older. Spent many years driving to/from work in various places, mostly in East Lothian. Got fed up with it. Got a new job, much closer to home. Husband suggested again that I try a bike. I protested that arriving sweaty wasn’t going to be a good start to my working day. He suggested an e-bike. Had no idea about them. He said, go for a test ride. Went for a test ride. Got on, with much trepidation. Set off round the block. Apparently, when I got back, I had a grin from ear to ear. “I want one” I said. So he bought me one. To be honest, neither of us was sure whether I would actually stick to using it. I got it in July and started using it every day to pop up to the shops, or just to get some fresh air between the showers. When term restarted, I cycled in on my first morning commute very nervously. Colleagues were intrigued, some positively supportive. Next day the pupils were back. I was pleasantly surprised by the reactions – a few made cheeky comments of course, but a couple said “Cool bike, Miss” and asked about what it was like to ride. Kept on cycling every day. Got some nice big panniers so carrying marking home wasn’t a problem. And of course, stopping off on the way home at the local shops for fresh bread, milk, fruit, veg etc was easy-peasy on my bike – with the car it had never been possible as nowhere to park. In fact the cycling was becoming such fun that I wanted to do more at the weekends, so bought a 2nd hand MTB which could go on the bike rack to take away with us for weekends in our campervan. During the late summer/autumn had several weekends up in the Trossachs and highlands, and managed several days out doing 20km or so on the MTB – yes, I know, small potatoes to those of you who rattle off 50 mile treks, but this is a middle-aged, formerly non-cycling old biddy, so I consider it a success story. Since buying the e-bike in July, I’ve only used the car 4 times to get to work – either because I had to take in extra equipment, or because I had agreed to car-share with a colleague to go to a meeting after school on the other side of town. I love my e-bike – for me it is the perfect commute machine – easy, speedy, and it gives me much more confidence, especially in traffic, because I know it has the acceleration to get me out of trouble if I need it, where I don’t have the fitness (yet!?) to manage so well on a regular bike. And because I started to enjoy cycling on it, I’ve also developed a love of cycling on my MTB in the countryside. Would I recommend it to others? – you bet! I followed up with a quick question about charging this bike up. It is a big inconvenience? Charging up is no problem – once the battery got conditioned – first couple of weeks it needed charging every 2-3 days, but now it will do me a full week of commuting plus shopping no problem, and in the winter when it has mostly just been a commute there and back, with no extra joy-riding (!) it has sometimes lasted a fortnight between charges – I’m only travelling a couple of miles each way. A charge takes 4-5 hours so just plug in overnight in the garage. When the weather is VERY cold, I take the battery off the bike and keep it indoors so it is warmer, as it seems to be more efficient that way. Just clip it back onto the bike when I want to cycle. A very uplifting story. This is the kind of revolution that needs to take place so our communities will respond with more routes and paths for cyclists. And just think what this does for the countries health! Bravo my lady friend! Welcome to the magical world of riding a bike!